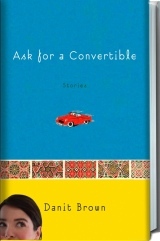 Ask for a Convertible, Danit Brown’s absorbing book of connected stories, revolves around the lonely, restless Osnat and a select few in her orbit over a period of about 15 years, mostly Israelis who feel the pull of another place no matter where they settle. Brown is wonderfully attuned to what’s special and strange about this particular pool of immigrants, but she’s careful to neither valorize where they come from nor paint their fraught relationships with their home and adopted countries as entirely unique. By the time she’s 25, Osnat has dated seven guys named Chris. Living in Chicago, she agonizes about returning to Israel, reluctantly certain that it’s the right thing to do. Osnat’s roots offer her an excuse for, and possible solution to, the disorientation that plagues so many people her age. She figures her life would be worth more if she lived in a place where just waking up everyday meant “making the statement that having your own country was important.” As she makes plans to move — and then move again — and obsesses over whether she’ll ever feel at home, her parents carry on an endless, knowingly futile argument about whether they’ll live in Israel again themselves. These sensitive (and often hilarious) stories ask what it means to be loyal to a place, and to a people, and what it says about you if you choose to defect. Brown paints Israel as a place that’s familiar and yet incredibly specific, where people respond calmly to terror alerts, work at dull jobs, worry about water damage to their apartments and fail their driving tests. To these characters, the country is somewhere to live, as well as to long for. It’s also somewhere to leave.